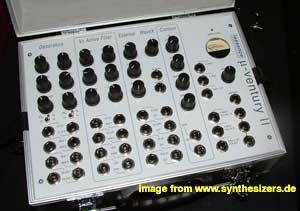 Martin Hollinger who is running the swiss Synth Museum Synthorama showed his Airböurne AVS-04 on the swiss synthesizer meeting in oct. 2006, it's a modular system based on FPGAs, the filters are modelled after the moog filter modules. 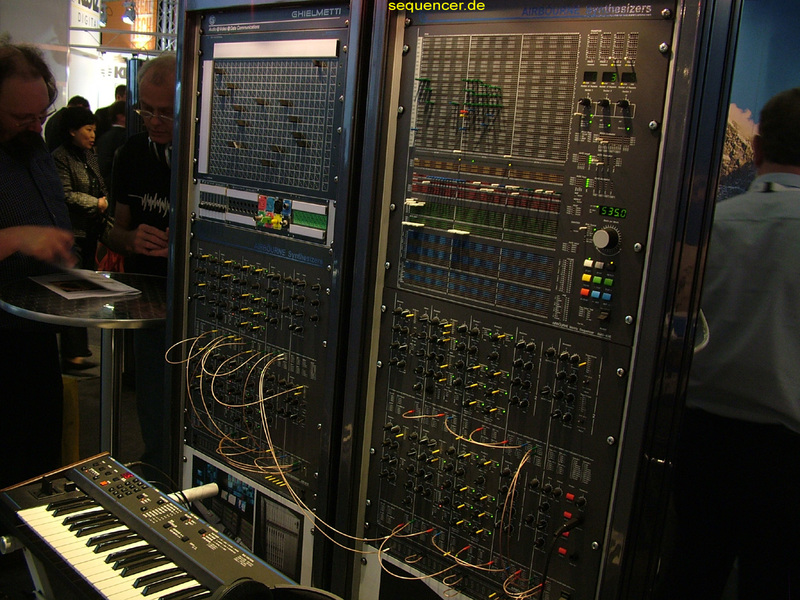 Colour coded pins are used to trigger notes in the sequencer shown in 2009, 4 colours represent tones and notes in the sequencer. 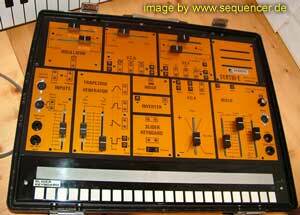 it can not save sounds, but it's digital but it can handle analog voltages like modular synths. more..
looks like an EMS? it's no EMS, it has a pin matrix like it, thats all.. 3 VCOs and MS filters are in here - thats one LPF and one HPF with Resonance each. 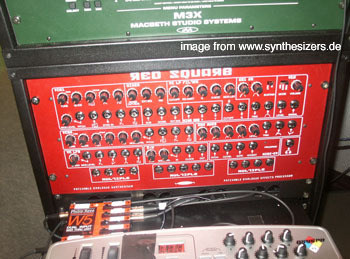 more..
the Phobos Red Square is quite something like the AS Spawn but bigger , also semimodular with quite special sound character.. more..
like Semblance but with additional patch panel - quite similar to Tom Oberheims SEM Version or the Anyware Semtex. 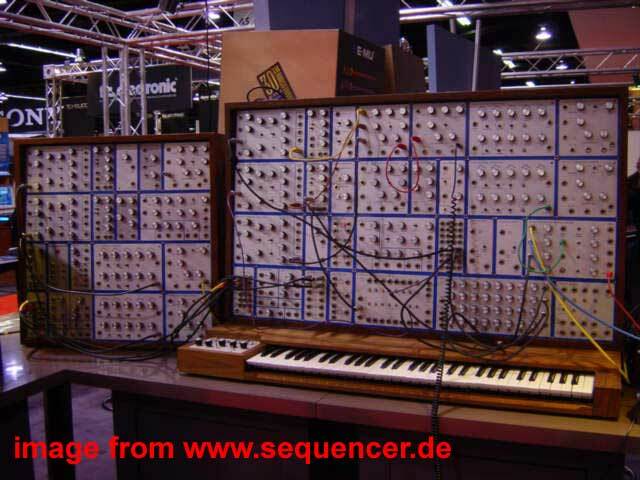 sort of Oberheim SEM clone with Midi, quite not as many changes like the modular Anyware Semtex, a 4voice Version is in the pipeline.. more..
sort of smaller version of the vostok, incl. 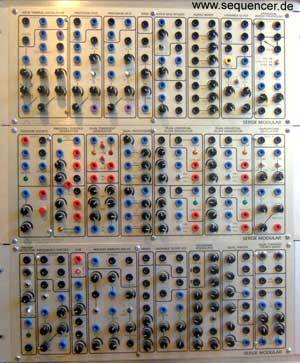 the patch matrix. 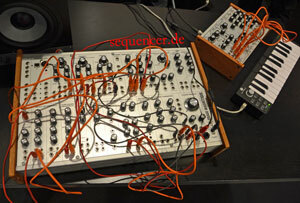 more..
AS doepfer-compatible system with 3.5mm jacks, lots of interesting modules available incl freq shifter (bode!).. free configuration.. more.. 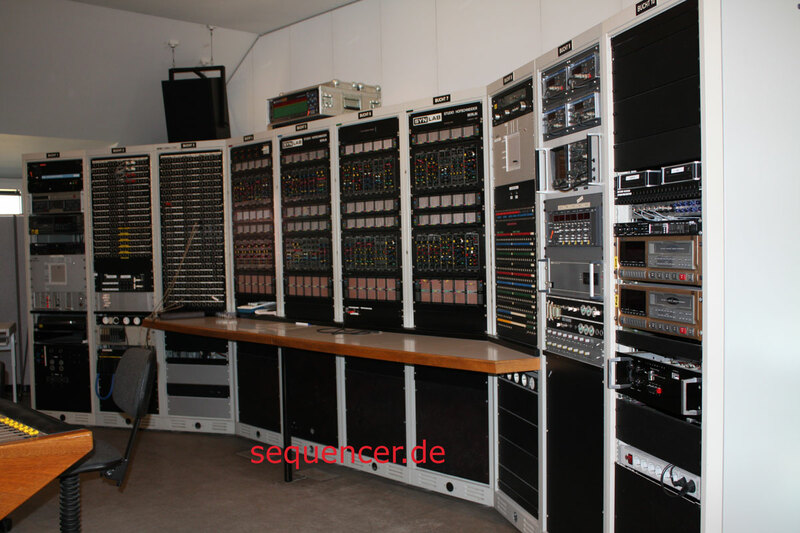 This is our personal Modular project which took place in the old and new sequencer.de forum and a small working group around Thomas form Anyware who did most of the Schematics and PCB Layouts. 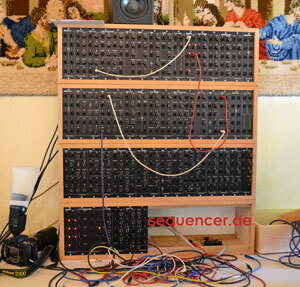 more..
New patchable concept of a modular synthesizer. All is done via the tiny (name!) patch matrix on very small room. 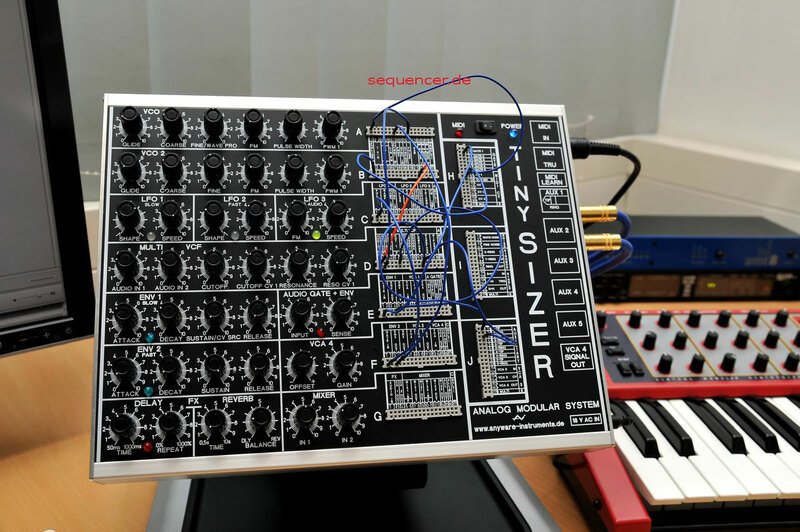 20 modules more..
like the Tinsizer this is really small and handy - new patchable concept of a modular synthesizer. 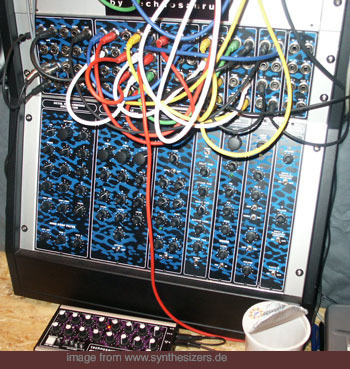 1 OSC, 2 ENVs (ADSR,AD), Moog-style ladder filter, 3 VCAs, MIDI, 6 jacks for interfacing with “the world”, 24 Knobs, 143 Patch Points 6 Waveforms, 2 AC/DC coupled lin/exp ctrl, PWM, sync, noise generator (white) ring modulator 2 LFO & inverter, 1 more inverter, clipper more..
possibly the best known ARP, the "natural born" competitor moog had only pure modulars to set against it, the 2600 is close to semi-modular? hmm, in fact is is a semi,because it has a not-so-easy change to rearrange the modules, but at a closer look it is possible. Mr Alan R. Pearlmans still very very good sounds synths. 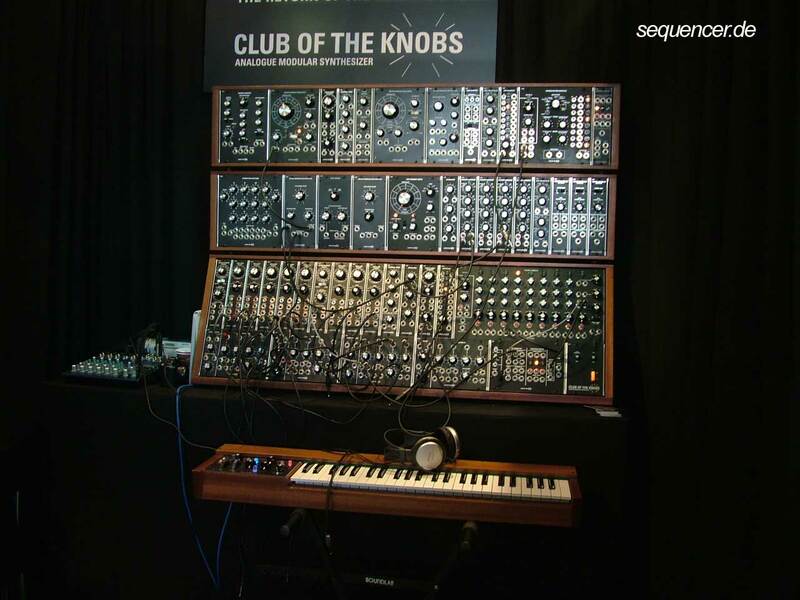 the sounds was the greatest competitor for its more "neutral" sound compared to the "moog" sound, which sounded more "synthesizer". more..
the system is a number of modules that are not mounted in a cabinet or rack but like stomp boxes but everything is there to make a cmplete modular system. for educational use - the keyboard is simple: 2 octaves monophonic and with "educational keyboard" written in big letters.. no idea about the price.. so this time it is just phantasy. 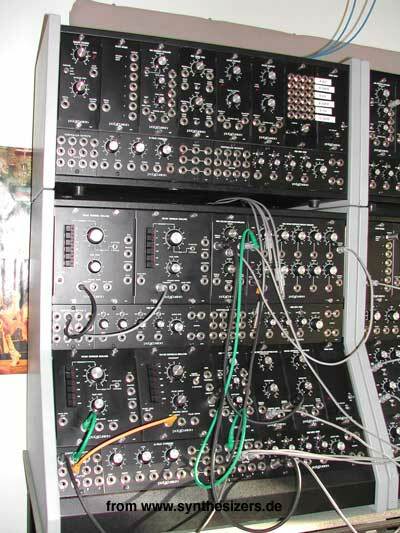 more..
the big modular system from ARP was freely configuarable, but mostly it had the configuration shown here.. a 4-voice keyboard was available, but I doubt that many customers used it for the very large of modules needed (well module 1045 contained a whole voice! 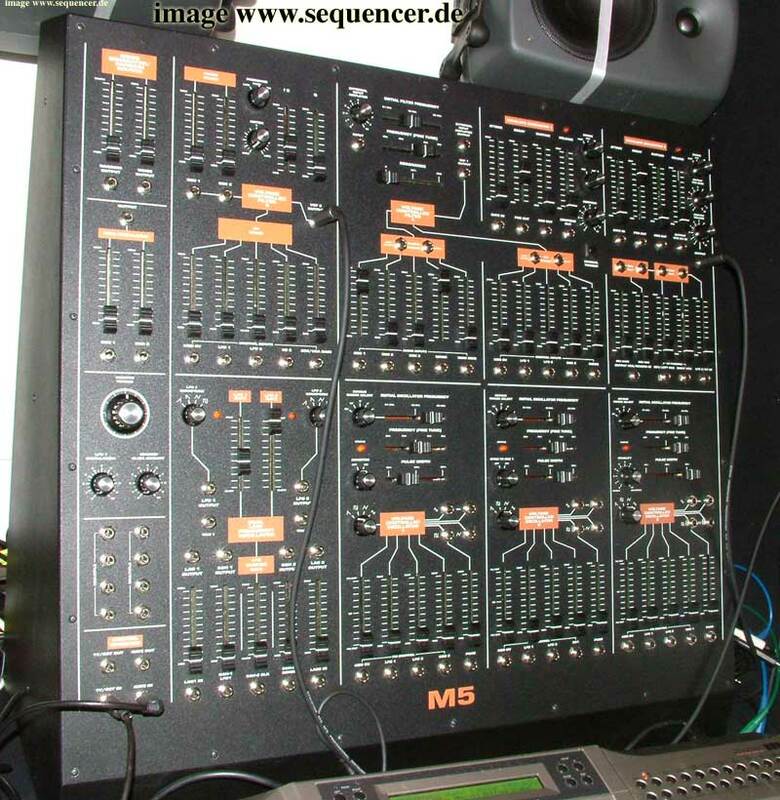 ), 10step Sequencer. special routing bus (20 on top and bottom) , so the users needs almost no or only a few patch cords. 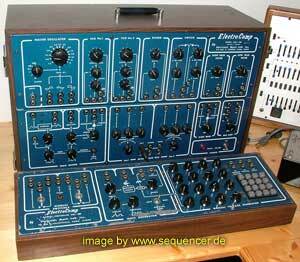 more..
Emulation of the Moog Modular System 55 (sort of. 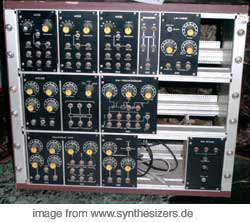 It uses the fixed filter bank as master out, so this part is not modular, others are free and filters are extended a bit.. well, this is the frist commercial Synthesizer, Bob Moog startet showing it on the AES in 1964 and had some visionary musicians as clients till 1969 when switched on back was released, after that Moog went over to become a real company. 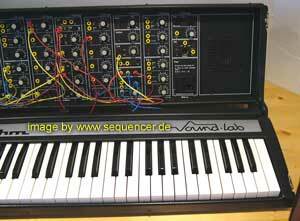 this is what a synthesizer is: synthesis = put together. 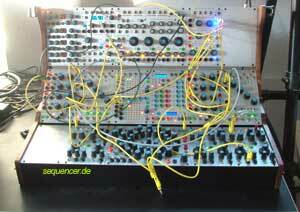 means putting together modules by patch cords, thats the idea.. more on the modular , click the Link.. more..
emulates the ARP2600 but adds the ARP Sequencer 1601 and a cool Modulation Sequencer, that allows complex movements. 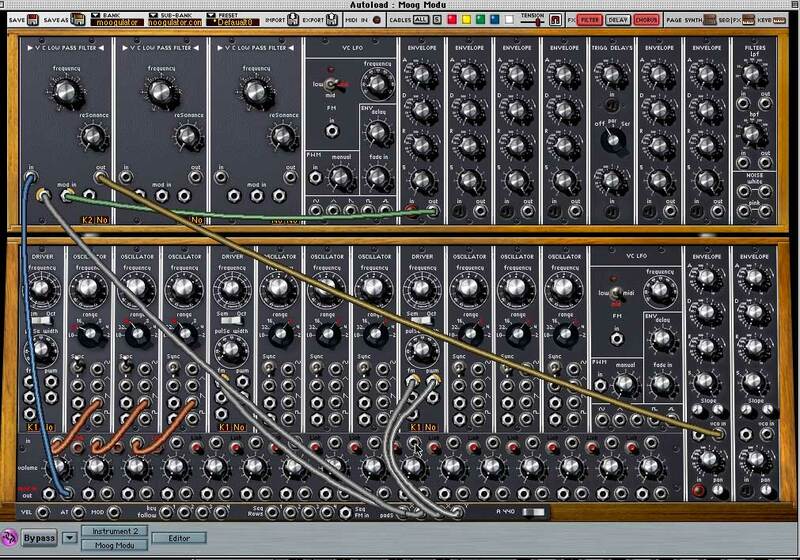 more..
Hardware version of the soft emulations by Arturia with 32 Step Sequencer and full Emulation identical to the software versons Moog Modular V, (yamaha) CS80V, Prophet V (vs + prophet 5), Roland Jupiter 8, ARP 2600 V, you can use any of these synths components like a Moog filter with 2 ARP OSCs etc.. Assumably the Jupiter + Prophet may not be in here? 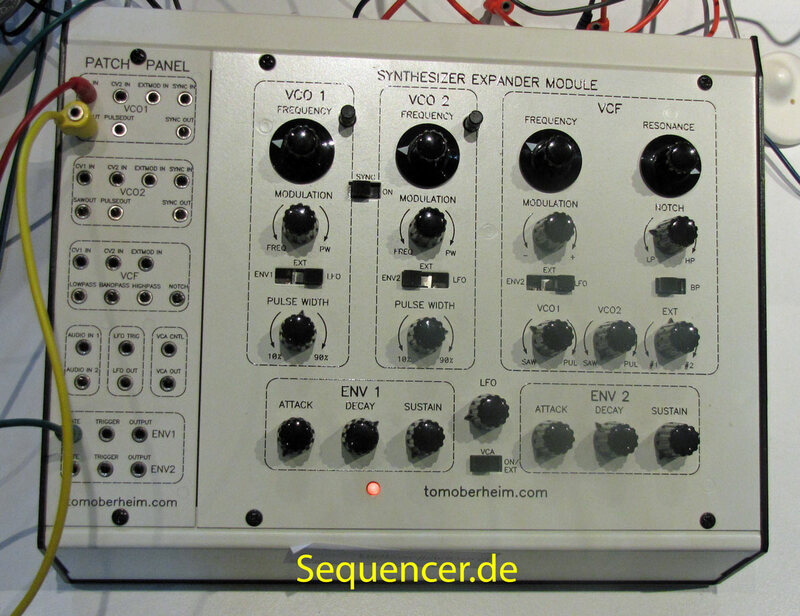 (wasn't on the list on the NAMM 2007) Added: Oberheim SEM filter type since 2012 more..
a modular system from H.P.Baumann from Aichach, was it a DIY project, first? 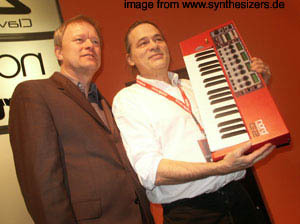 more..
Böhm Soundlab by Professor Enders (University of Osnabrück) and Oliver Kellogg (electronics specials). was released.. duophonic keyboard. 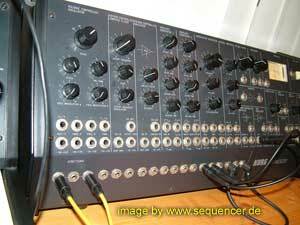 THE BOEHM SOUNDLAB .. short info.. it uses banana jacks and is quite interesting / flexible. it provided multi mode filters when HPF,LPF,BPF combinations were still rare. böhm is a german electronic organ company for DIY kits and other stuffs from minden in germany. biggest competitor is wersi ;) find a nice info about the soundlab in "Synthesizer von Gestern Vol.2" by M.Becker who also released 3 CDs feat. Vintage Synthesizer Tracks .. the böhm was the only synthesizer by böhm beside the böhm dynamic expander with casio-type of PD synthesis , in this case phase modulation meaning phase distortion ;) the soundlab is quite rare and boehm offered DIY Kits and assemlbled ones. quite interesting modules were made. 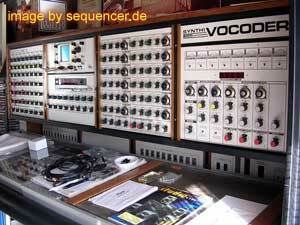 You can reach Prof. Enders here: bernd.enders ÄT uni-osnabrueck DOT de and his (german) book is still available: http://www.epos.uni-osnabrueck.de/music/templates/buch.php?id=19 more..
Don Buchla is "the other" Synthesizer Pioneer beside Moog, he did a lot of very innovative instruments and there is still the Buchla 200e .. The Music Easel is no toy.. more..
Don Buchla is "the other" Synthesizer Pioneer beside and not smaller than Bob Moog, he did a lot of very innovative instruments and there is still the Buchla 200e .. it follows a special philopsophy which is not designed for VCO-VCF-VCA-kind of principle (some call it the west coast principle..) more..
this is a re-made reproduction of the classic Music Easel from 1972 - shown on the NAMM 2012 the first time. 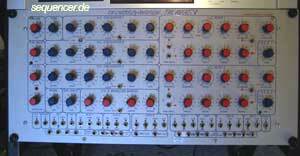 Don Buchla is "the other" Synthesizer Pioneer beside Moog, he did a lot of very innovative instruments and there is still the Buchla 200e .. 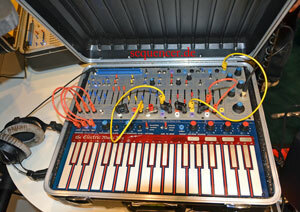 The Music Easel is no toy.. more..
one slot of the nord modular in a smaller case. A DSP Synth, also works without computer (even for parameter change), the only thing you need it for is to edit/create a new patch via a second MIDI port. The number of voices will be reduced depending on the patch complexity. max 4 voices, in fact it will be almost 1 or 2 voiced.. more.. 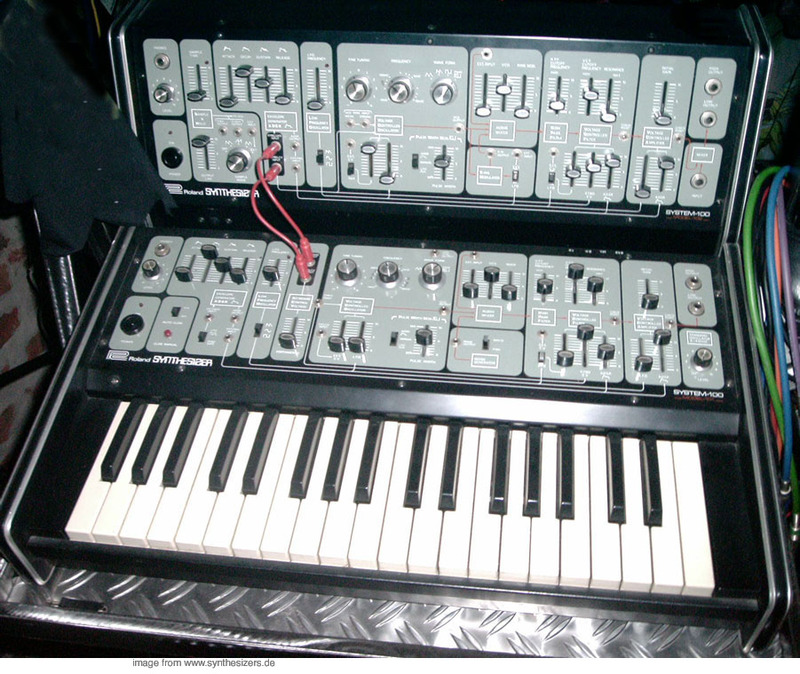 Predecessor of the Nord Modular G2. A DSP Synth, also works without computer (even for parameter change), the only thing you need it for is to edit/create a new patch via a second MIDI port. The number of voices will be reduced depending on the patch complexity. 32 voices is the expanded G2, standard: 16. more.. Successor of the Nord Modular. A DSP Synth, also works without computer (even for parameter change), the only thing you need it for is to edit/create a new patch via USB. The number of voices will be reduced depending on the patch complexity. 32 voices is the expanded G2, standard: 16. more.. This is a modular system reminding a lot of Moog from Portugal, but the founder came from germany (Düsseldorf) and 2008/9 he (Gerd Peun aka Kazike) was joined by Georg Mahr from Düsseldorf - now they got classic Moog modules as well as new creations like a 2 Arper-Keyboard which can address multiple voices like the sought after Roland 184 Keyboard. more..
matthias began with DIY synths and they are still available, now there are complete systems available in standard "moog" size (motm etc..) the earlier ones where formant size (6 HE) typical new format is now 5 spaces like moog / MOTM and find a steiner parker filter in here (stonehenge) and some nice clock dividers/sequencers in small size more..
swedish semi modular synth with ultra-fast envelopes / VCA and 2 filters with midi control, it's pronounced "svai-man" more..
this system is very slim and there are enough modules out to make full modular system incl a module with one complete voice like the roland system 100m more..
Dieter Doepfers Modular System offers a laaarge variety of modules, even 8bit samplers that allow CV control for position, modules are very different in sound quality.. take a look, there are very interesting ones among them.. more.. I do not know much about this system, even when it was made. EEF was formed by the DIY activist Eric. 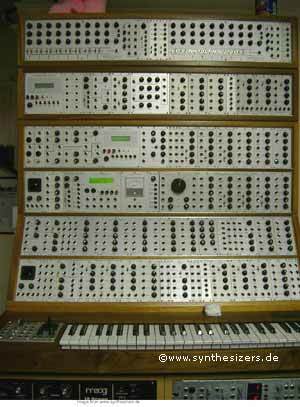 E. Feremans in Antwerp (Belgium) who was also part of ELK-Muziek (guy2d.com posted this info) eight EEF Sequencers 16-4 were made - one of them being used by The Klinik (Dirk Ivens / Marc Verhaeghen) more..
first EML synth, blue and strange key sytem ElectroComp 200 more..
well, something like a sequencer with small sound generator.. more..
originally for education purpose (? ), well.. in the US? here in europe/germany I did not see too many of them, still.. so all EML is rare "for me at least". 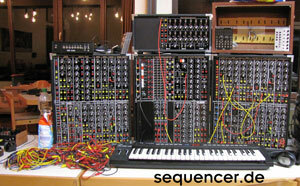 Semimodular but no chance to rearrange the modules. more..
A classic! looks like a russian power plant control. a matrix controls what is modulated by what source. there are not too many requests for keyboards or midi, quite "clinical" Sound, very british also. quite minimalistic (no lfo and only one ENV). anyway worth more than one ear. the CD David Voorhaus - white noise was made with 2 VCS3. 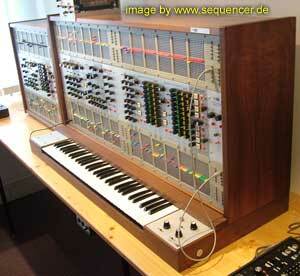 more..
AKS: a keyboard with 256-step sequencer (optional), btw the first digital sequencer. A classic! looks like a russian power plant control. a matrix controls what is modulated by what source. there are not too many requests for keyboards or midi, quite "clinical" Sound, very british also. quite minimalistic (no lfo and only one ENV). anyway worth more than one ear. the CD David Voorhaus - white noise was made with 2 VCS3. more..
A classic! looks like a russian power plant control. a matrix controls what is modulated by what source. there are not too many requests for keyboards or midi, quite "clinical" Sound, very british also. quite minimalistic (no lfo and only one ENV). anyway worth more than one ear. 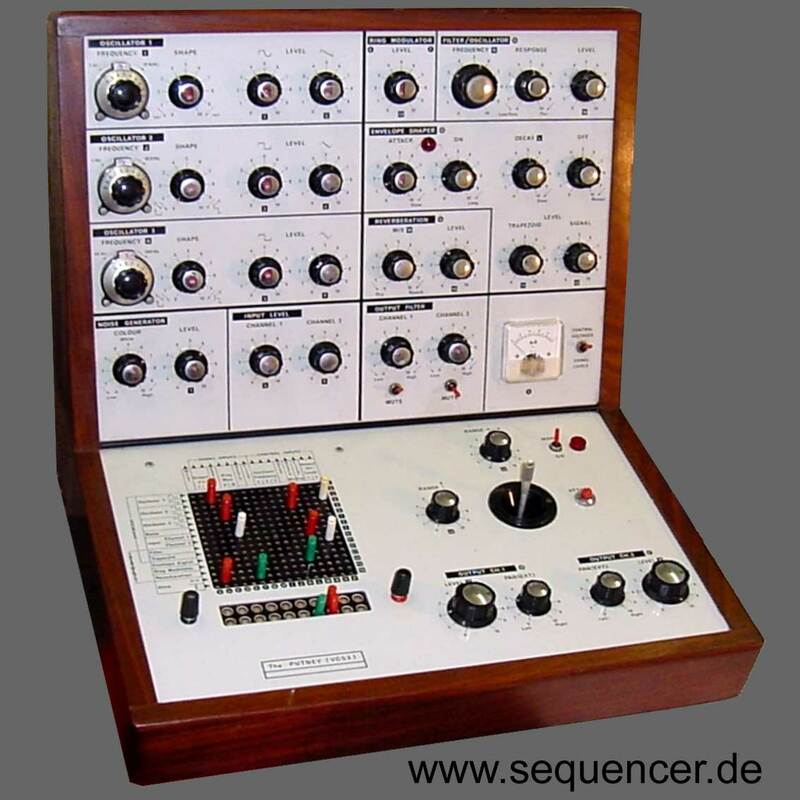 dr. who was recordet with one of them and stockhausen told about it "boring filters but a fascinating sequencer" more..
the professional version (synthi p stands for). well, in fact it is a better synthi a and never went into production more..
the educational (thats what stands "E" for) synthi for schools needs patch cords to connect the modules. 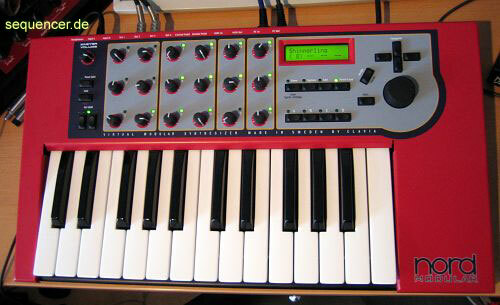 it has a ribbon and sensor keys to play it.. quite simple synth. more..
innovative Modular system, also with digital Modules. 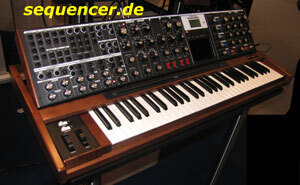 Oberheim and others got their keyboard from emu (licence of course), perhabs you have heard one on Vince Clarkes records?.. also meat beat maniesto had (have?) one, do they still exist?.. more..
the system is inspired by the sound of planets - so the names are (french) and referring to the result in space - in fact there's oscillators and LFOs of course. also a module allows to connect sensors to it (pressure/force, light, distance..). 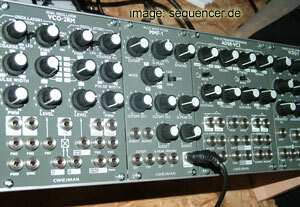 the main system is about the size of 2x eurorack standard in one case or as a smaller separate module rack. more.. It's an analogue synthesiser. Tony Wride from the UK built it. 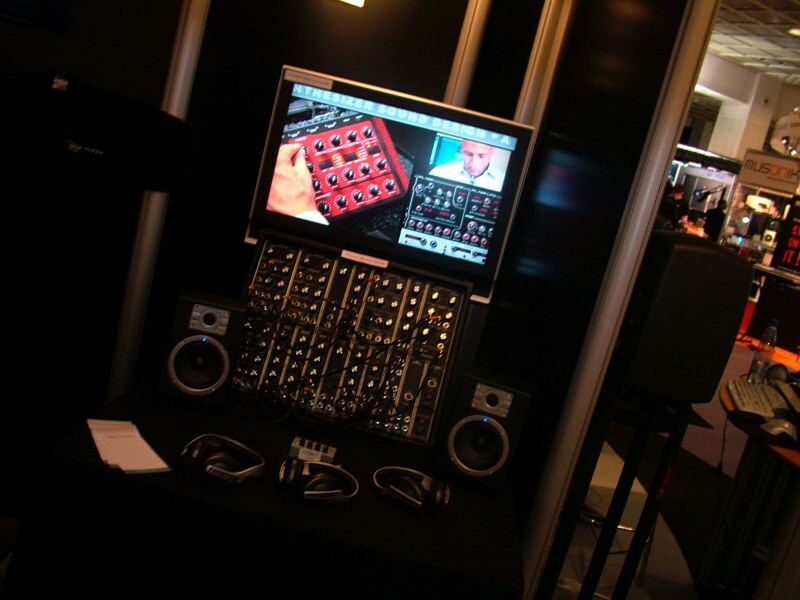 more..
the new and first modular by future retro shown on (winter) NAMM 2006 first. thought to be stacked to get more VCOs and LFOs.. price is not yet fixed. more..
an expander for the semomodular ms series, the ms50 is real modular (while ms10/20 aren't really modular), a bit overrated and therefore expensive. more..
this was connected to the bluebay site (disappeared some day).. Lassence µVenturyII mini modular system made for percussive sound reinforcment/treatment from belgium in a suitcase.. more..
quite ARPish look but different in concept and sound: prepatched routings that can also re-arranged by the user, so this is more than "semi modular" synth, it has 2 filters and almost everything you need for a modular system more..
small synth with really astonishing features incl. 35 patch jacks for semi modular patching at this size! 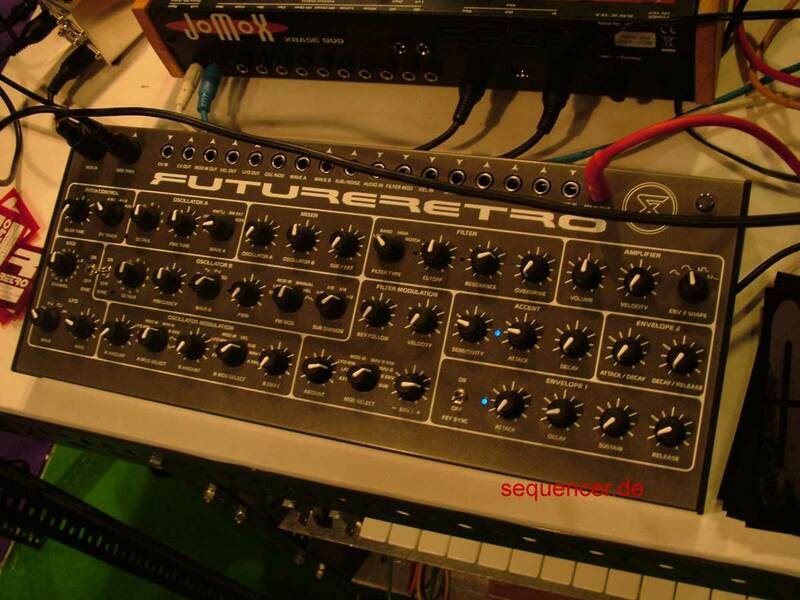 The official name is Kraftwerg (power dwarf), not Synth 3. more..
this is a perfect addition to the Kraftzwerg which is something like a new Korg MS50 in our times… has a morphable filter! more..
a TR-step sequencer with 6 CV/Gate outs to trigger internal and external modules, internal sound is 4 basic drum modules that can be orderes as modules also. 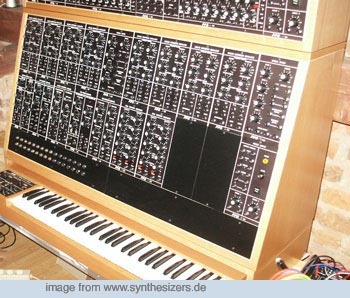 more..
well, this is the frist commercial Synthesizer, Bob Moog startet showing it on the AES in 1964 and had some visionary musicians as clients till 1969 when switched on back was released, after that Moog went over to become a real company. 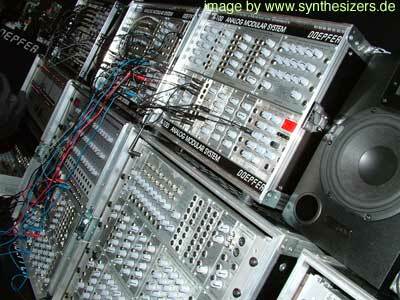 this is what a synthesizer is: synthesis = put together. 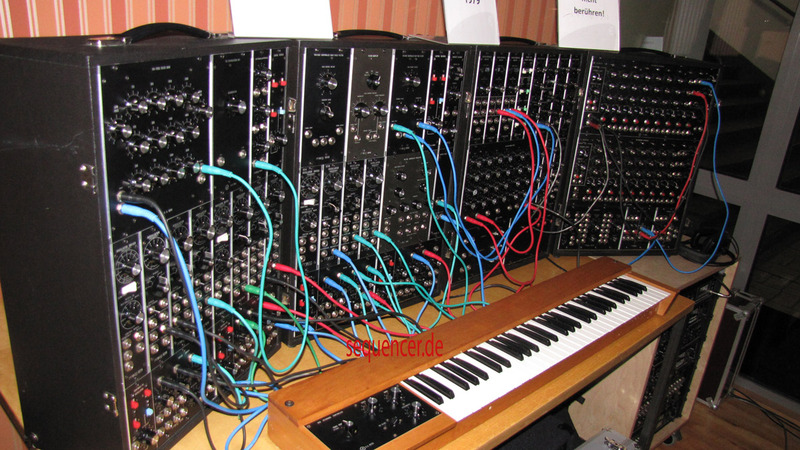 means putting together modules by patch cords, thats the idea.. more on the modular , click the Link.. Moog themselves re-released the System 15, 35 and 55 in their original setup starting at 10k€ - list of modules see below. more.. The XL is basically the same as the Voyager but adds the two expandsion boxes VX251 and the "Moogerfooger" CP251, they add most of the V'gers internal outputs, multiples, a 4 ch-mixer, LAG processor and another LFO. Also added is a larger Keyboard and a Ribbon Controller. 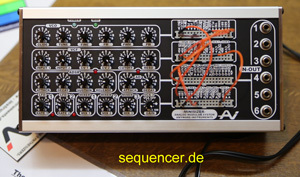 Yes, this reminds a bit of a larger MS20, it's still semimodular but fits nicely into a modular environment or may help to use the V'gers MIDI for external Synths as well. 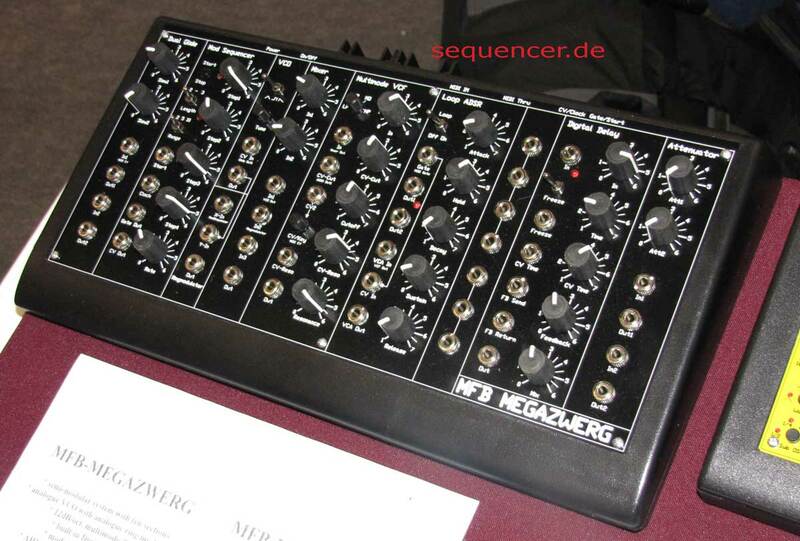 this is the successor of the legendary minimoog, it has 2 filters with spacing, ADSR envelopes, an LFO, PWM and sync. 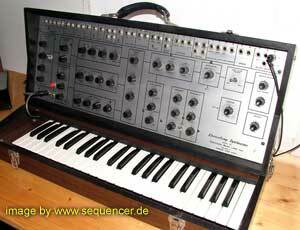 well, if there is a classic synth, THIS is it! 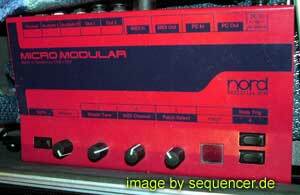 to be exact the minimoog is model D, the first 3 models did not see the market but were made of moogs modules (the filter, ENVs etc.) 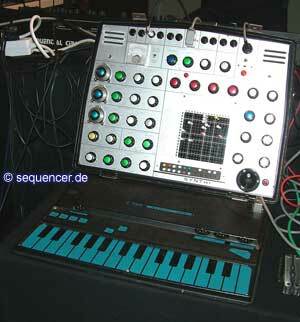 , the idea was to make a portable synthesizer with a keyboard, something quite new at that time. btw. the moog cascade (ladder) filter patent is no more valid. moog had to use the name big briar till he got his company name back. 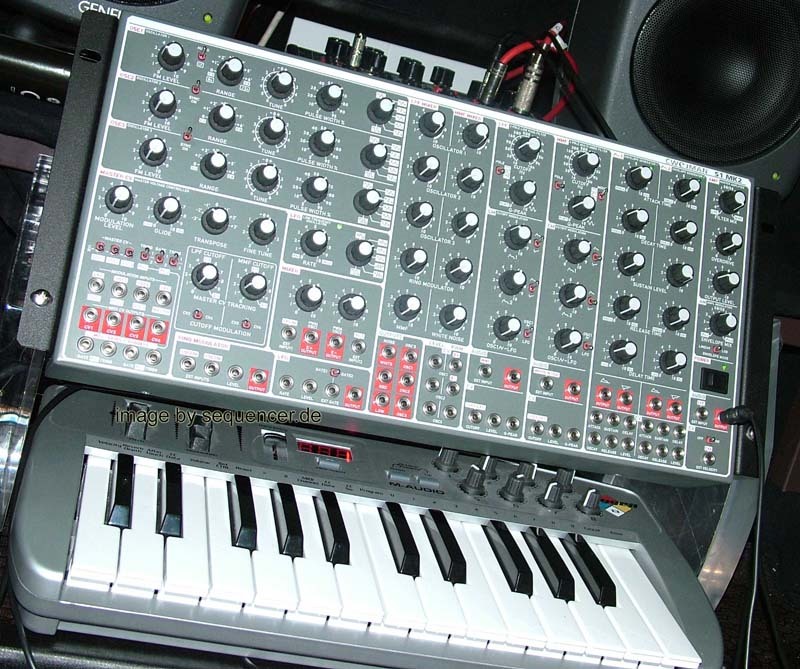 Bob Moog died in 2005. more..
bsynth uses 3 sections with OSCs (additive, fm, granular samples) and 2 freely assignable modules (filters, shapers, ringmod..) they are mixed and manipulated by 2 more master modules (same: filters, ringmod, shapers..) more..
First real native commercial modular Synth which has changed to Reaktor after introducing Transformator (the granular sample module) and generator was first.. strict 2 sided basic structure: 1) patches (structures) 2) panels and knobs (panel) 3) all together (ensembles) uses also OSC to communitate with other computers / controllers (like lemur) via ethernet.. more than midi resolution possible. more..
Ex Moog Employees reformed to make a very moog style and size modular system, even the ciruitry is quite close (simliar?) exept the layout, they also improved the ciruitry and made 8 voice keyboard with velocity (! 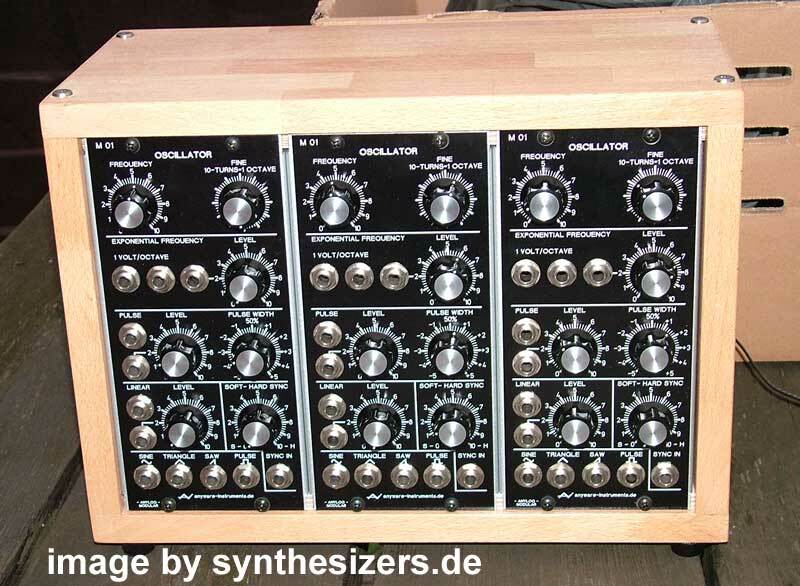 ), btw they still exist, but do no longe built synthesizers but hi-end amps.. more..
Wolfgang Palm made his first modular System 100, later the 300 witch was also available with german lettering (strange one ,even for germans). keyboards range up to 4 voices (quadraphonic) more..
the Roland 700 is a very nice modular which has prepatched jacks that can be changed by just pluggin in a patchcord. so it's much more to get out of the module. it is not as compact as the smaller 100m, so one module is one funcitonality on this system - ah, btw: of course the modules could be chosen by the user. 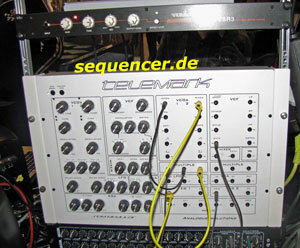 more..
Roland and Malekko teamed up to make a new version of the System 100m but shrunken from 10cm to 3U eurorack size. more..
this System reminds a bit of the SH5 and it's exatcly the SH-Sound (thats a good thing). of course it has no manual BPF like the SH5 but it is modular. to be exact: it is semimodular because it allows not to access ALL parts. system parts: (101: 1 ADSR, 1x Filter 12dB/oct LPF, 1x LFO, 102: 1x ADSR , ringmod, 1x LFO, 1x Filter 12dB/oct LPF, 104: sequencer, 103: mixer) surely you can use the two 102 + 101 as 2 synths, so it is 2 voice more..
Serge is rare, it's made by the Serge Tcherepnin he lives in the us (russian name, true! 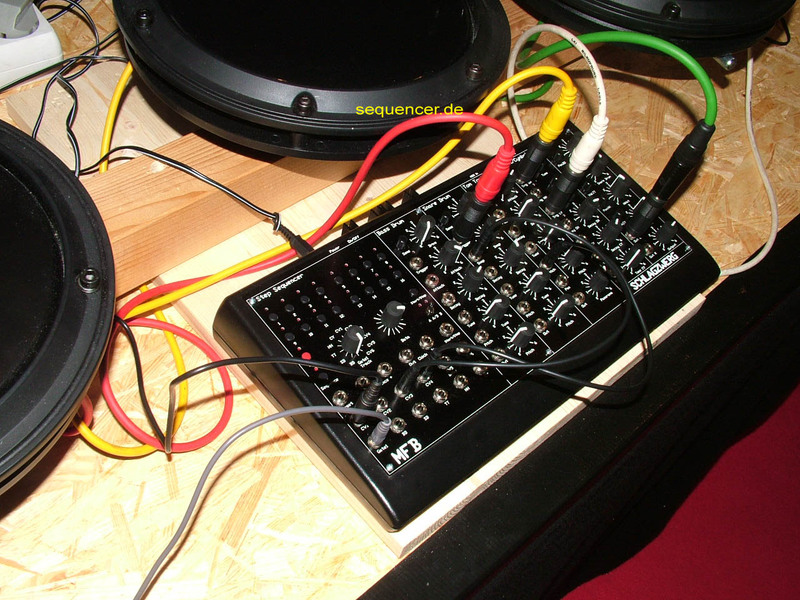 stems from France) - serge modulars were available as DIY kits in the past. 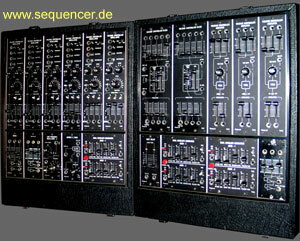 Serge still producing Modules.still produced. I still mark the VCOs etc, 999 (unfinite), but the modules are "fixed". 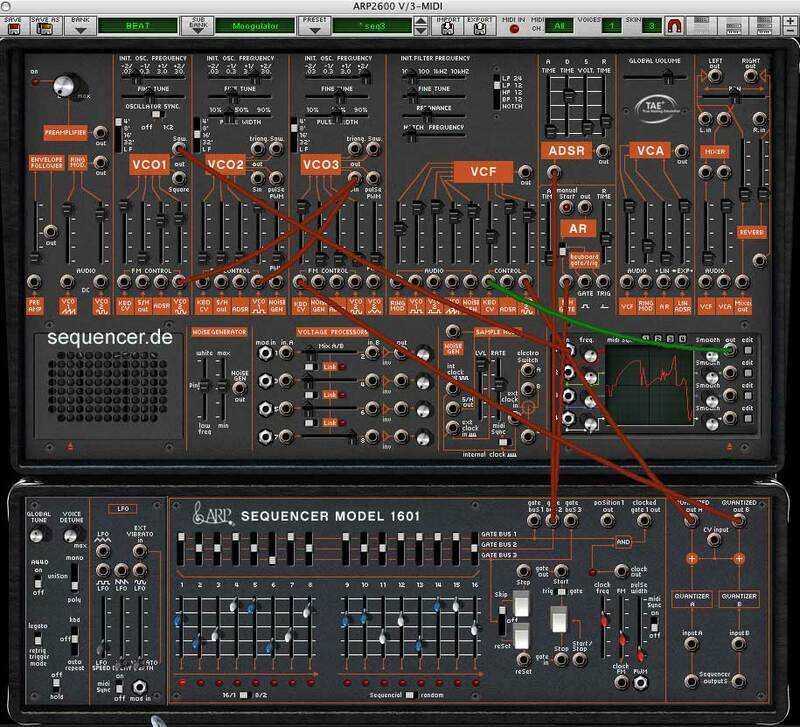 Serge is now Rex Probe who did it all for the recent 12 years.. more..
Kyma is a DSP System and was developed over time by Carla Scaletti on a Mac, the Hardware is called the Capybara 320 (atm) it has slots for double DSP cards. 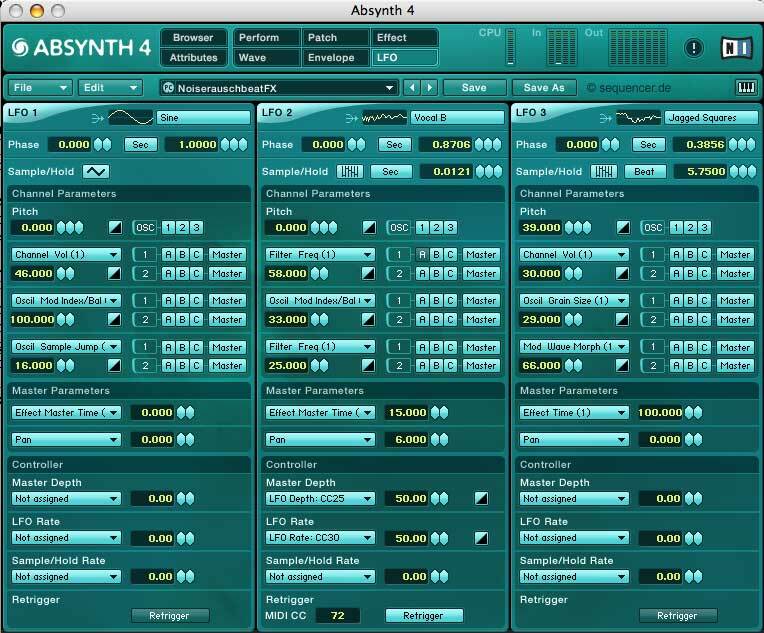 Kyma allows complex processing like spectral vocoding, real time audio morphing and audio processing. 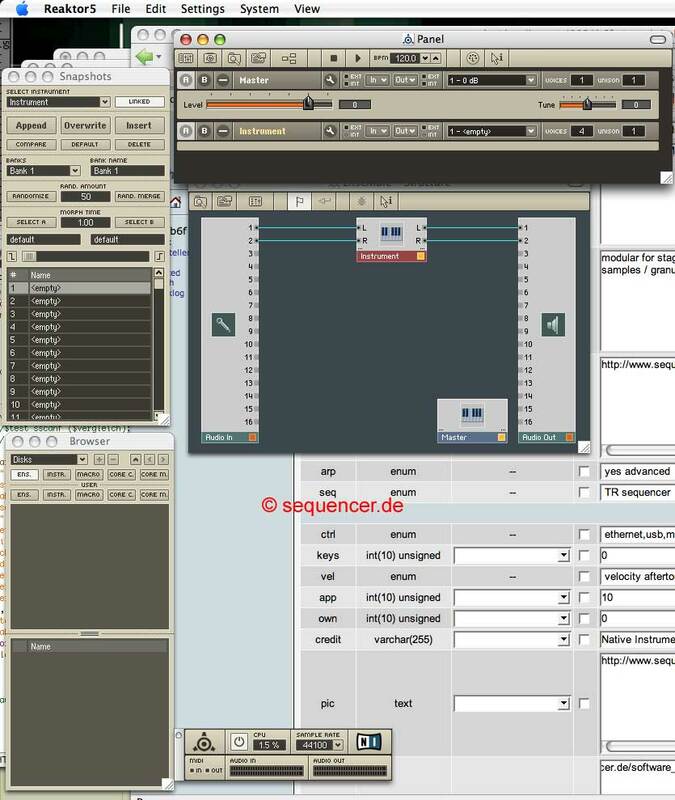 It has also a timeline to load and change "FX" and processing and arrange them like on a sequencer. 4 DSPs max 28 (Motorola) - Motorola 56309? 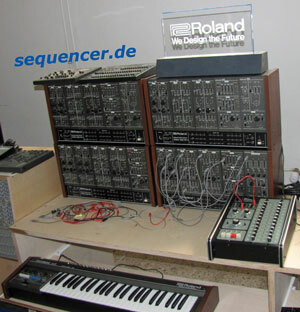 more..
this system is quite similar to the ARP2500, it was made by Professor Dirk Reith and the Hofschneider company in germany - it has been improved and changed in its layout and look but the 2500-bus / routing system is the same.. I believe it is unique, so there is no more than the one at the Folkwang School in germany (Essen). well the rest is almost like the ARP info: the big modular system from ARP was freely configuarable, but mostly it had the configuration shown here.. a 4-voice keyboard was available, but I doubt that many customers used it for the very large of modules needed (well module 1045 contained a whole voice! 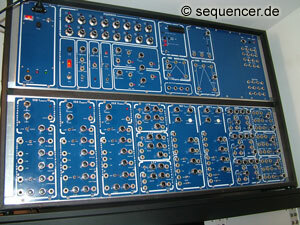 ), 10step Sequencer. special routing bus (20 on top and bottom) , so the users needs almost no or only a few patch cords. 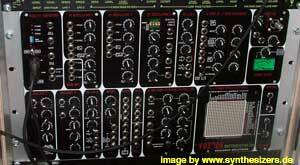 more..
freely configurable Modularsystem very close to Moog (sonically), freely configurable.. more..
high quality modular system from jürg oldani, switzerland. 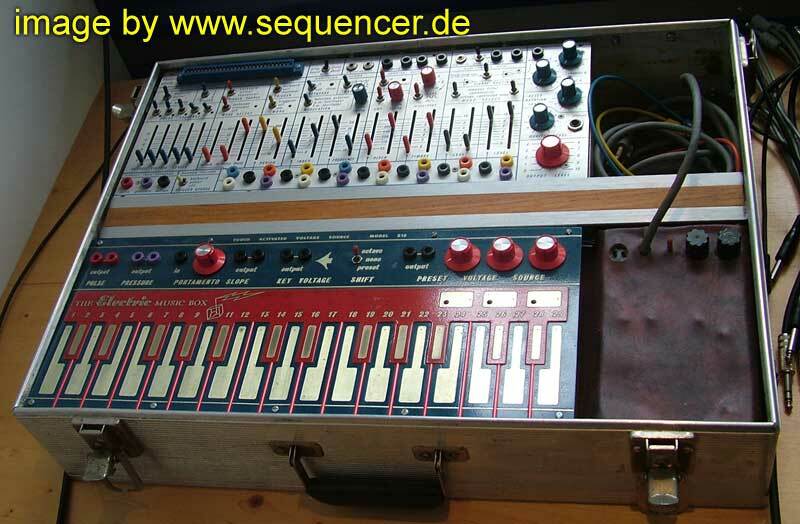 4 Modular Systems A-D. more..
quite cheap nice Modular System from Horst Theis, Germany more..
Tom Oberheims first Synthesizer Module re-released but built as SMD (thats smaller in scale) - the module itself is the same size as the original old one. more.. (! 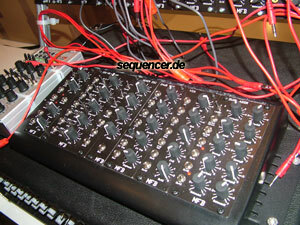 )© 2000/2011 sequencer.de - please respect this work - dont use info/images for auctions/ your site - please ask + link back! *** Keine infos / bilder verwenden, auch fuer auktionen und homepage - bitte vorher fragen und zurueck linken!